For millions of people worldwide, daily life is a painful struggle.. "Expiry Date 25000 Days" is a handbook that reminds us all that life is a short and impermanent journey and that we should celebrate each day before it is too late. In thoughtful and insightful language Michael gives you 25 powerful tips on how to turn negativity and depression into practices that create happiness and vibrancy in your everyday life. These guiding principles will help you live life to the fullest, shrug off adversity, and become a happier, calmer and kinder person. And you just might end up more fun to be around as well. As an ex-police officer Michael says saw more human blood that he thought was possible for one man to see in peace time. From fatal car accidents, to gruesome suicides and homicides Michael realized one day that none of those people who died realized it was their last day on the planet. As human beings, we all go through Tough Times. In this handbook, Michael explains the ways in which everything usually turns out for our greatest benefit if we stay content, and surrender to the flow of the universe. This handbook contains powerful lessons on how to stop worrying so much, and to live a life of greater contentment and long-lasting success. Whether you are struggling in your business life, your personal life, your family life or your love life, surrendering to fear and judgment will get you nowhere. Surrendering to the flow of the universe will get you everywhere. "Expiry Date 25000" is a hard hitting, practical guide on how to live every day of this brief journey called life with less fear and more joy. We all have an expiry date! How many days have you got left? Author Bio: Michael Kuzilny is a successful Criminal Defence Lawyer, Author, TV presenter and success coach. He is the author of Success: You can make it. A former policeman, Kuzilny has worked in the criminal justice system for over 30 years. He has dedicated his life to helping people through the tough times; and has a genuine passion to make a difference. He has shared his experiences and life lessons with millions of viewers on the National TV, and has spoken in front of large audience in virtually every major industry. 5.0 out of 5 starsWhat a top book ! Simple, raw, and very real ! Michael Kuzilny is a truly unique and kind hearted man. He has done it again to inspire my family with a powerful and straight to the point handbook that was so much needed at this time. No gimmicks here. We have read some of his other books , but this one really takes the cake. My family went through some difficult times last year including a death of a family member by suicide, and several members in my family suffering from depression and general anxiety. Feeling like there is nothing worth living for anymore. They say depression is on the path to be a global disease by 2030,so this handbook comes at the right time. Michael Kuzilny's 25 points are hard hitting and powerful and make you think twice about complaining about the tough times. Mr Kuzilny is quite right, no need for self pity parties, we all have an expiry date ! Truly grateful, thank you. I have just finished reading Expiry Date 25000 days having recently returned from two months living abroad in a remote part of the world where the people have nothing, are happy and live in the moment. They face a hard life but just get on with it. Coming back and reading this book is a stark reminder of how so many people in the western world have everything, yet are so stressed out and seem the unhappiest. That's why this book is such an important reminder to us all. If we could all just take into our hearts Michael's words by accepting what is, and living in the moment then the world would be a much better place. This book is an inspiration to follow your heart, do what you love, live in the "now" and help others in any way you can with compassion and love. As Michael also says, the chase to work harder and buy more stuff to ensure happiness is an illusion. He is so right. Happiness is simply a choice we can all make right now. I will be referring back to this book many times. 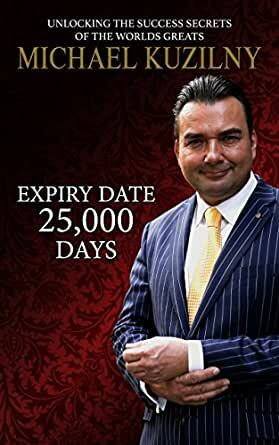 Just enjoyed Expiry Date 25000 Days, Michael Kuzilny reinforces and consolidates what we all want, need as souls. Nothing new or extreme, just a reading experience to focus you back to the reality of your being, like a rebooting a computer. We all suffer or emulate some the negative traits, this book is a mirror. It's there for you to read over and over whenever you need to "reboot". Well done Michael and thank you. 5.0 out of 5 starsA breath of fresh air and a quick fix to any of your life's problems ! Extremely easy to read very real ! I really enjoyed this book, and although I was not a big fan previously for e-books, I am so glad I found Expiry Date 25000 days. I went through a very dark period in my life when everything seemed to be falling apart and I felt very lost and alone. Michael Kuzilny wrote this book like he was speaking to me directly. He is so right with the powerful lessons he shares. It was an very easy read and completely had a new outlook on life when I came to the end. It only took me one hour to read which was great. I have since re-read certain lessons whenever I start the self pity parties again, but certainly well done to this amazing author to who spends most days in court helping people in need. The boom is aimed at enabling us to enjoy everyday life, because life is too short. The author, Michael Kuzilny, gives useful tips on how to enjoy our life everyday by changing our attitude towards life. The book showed me that by simple changing the way a look at certain situations and deciding to enjoy my life, I can be happy in this life. Even after facing tough times, it is possible to go on and the tips in this book will show you to achieve this. I just purchased the book by the author Michael Kuzilny i purchased it through AMAZON so easy. The book contains the powerful lessons on how a we must stop worrying so much and live life to the fullest. The book also guides us to live with less fear in this world and have more joy. After reading this book it is such an eye opener let us not waste time in this world lets be happy. I recommend this book to all who want to live life to the fullest. Follow the guides in the handbook and joy and happiness will occur.